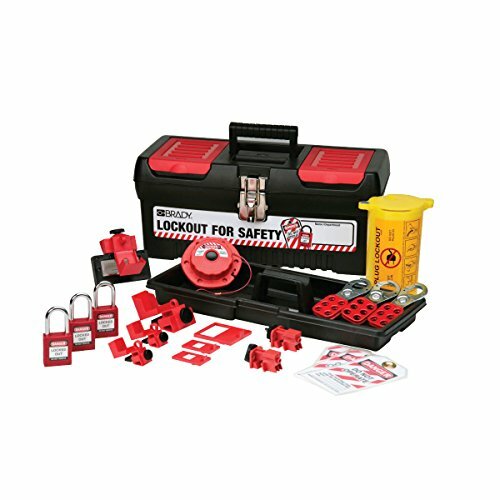 Brady 105961 personal electrical lockout kit provides lockouts for use on most circuit breakers, electrical plugs and disconnect switches. The components are 1- mini cable lockout (50940). 1- 3-in-1 plug lockout (PLO23). 2- 120/277V clamp-on breaker lockouts with cleats (65396). 1 - 480/600V clamp-on breaker lockout with cleat (65397). 2 - universal multipole breaker lockout (66321). 1 - oversized breaker lockout (65329). 3 - 1" group lockout hasps (65375). 3 - heavy duty lockout tags (65520) with nylon cable ties. 1 - medium lockout toolbox (105906). 2 - keyed-alike safety padlocks.